The Digital Money Forum is an event that this year reached it's 15th anniversary. And a special event it is. My previous visit to the Forum was probably some ten years ago, when everyone was pretty much into the e-money way of life. But technology, money and society continue to develop and that's where Dave Birch and his team of Consult Hyperion come in. In setting up the forum they provide for a lively and thought-provoking event where money is dealth with from all different angles. And as before, it was a pleasure to participate. So this years event was special in many ways. 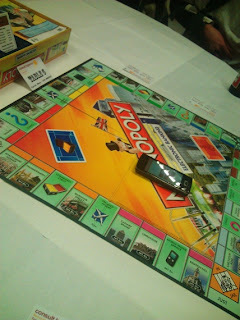 We all got a better look at the evolving phone payment landscape, delved into possible future scenario's for the world and money, we spoke about the future and death of cash, about social inclusion and lots, lots more. And, quite fascinating, I got to issue my own currency, PunkMoney, via Twitter, by promising the developer, Eli Gothill, two beers and a financial history tour in Amsterdam. A bit more on the principles of Punkmoney (as I understand them). If we look at money it is an invention to facilitate transactions in society. But before the official money we had mutual obligations and trust relations in society. I would help my neighbours out with building their house, assuming they would do the same for me, in time. And so on. So there was this web of mutual obligations and promises that cemented the relations in society. Now what Punkmoney does is to leave all the monetary issues and digital money aside and elegantly replicate this web of promises. With some rules as how to form proper messages, Twitter as the carrier and a software enige that scans twitter for any promises of Punkmoney. And when it finds one, it registers it and there you have it. Not the real money, but something even better: real promises. Just as trustworthy as... yourself. After Punkmoney, we moved on to another kind of money. Monopoly money, sitting on a Samsung phone (with an application neatly developed by Easan). Some more on that will follow on my financial history blog later.